I wanted to call attention to the scale that I found, which to my way of thinking might just be the perfect scale for RC sailplane building. It is made by LW Measurements under the brand name Tree and it is their model MRB 2500. I ordered it from Zieis for $79.97, which included free shipping and a 5 year warrantee. Why dedicate a page to a scale? Mainly because in all of my online reading of various folks' build projects, I have seen many scales in use, but never this one. Nothing I had seen seemed to be exactly what I was looking for, until I came across the MRB 2500. -- So I thought I'd highlight it on the chance that it's what someone else is looking for as well. What I believe makes the MRB 2500 so right for glider building is its relatively large size, its capacity and its resolution. 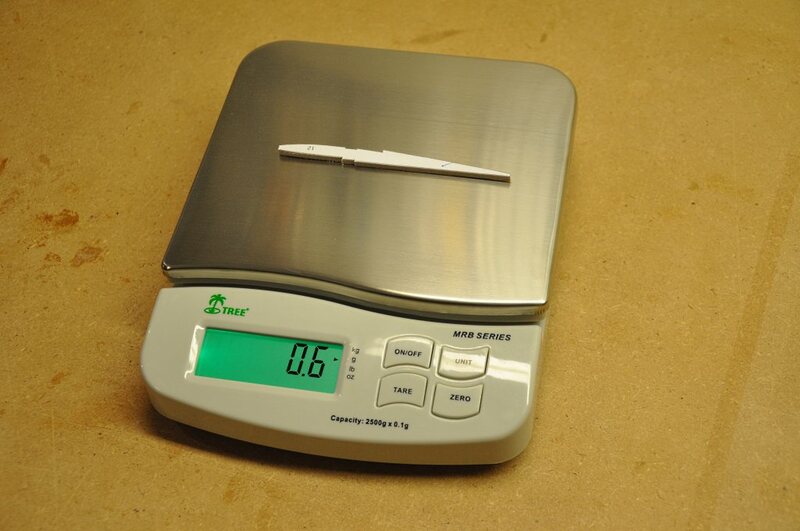 The scale can measure everything from 0.1 gram all the way up to 2.5 kilograms. (or 5.5 lbs. or 88 oz.) This range allows weighing very small items, like a single balsa rib, all the way up to your completed (and ballasted) F3X sailplane! 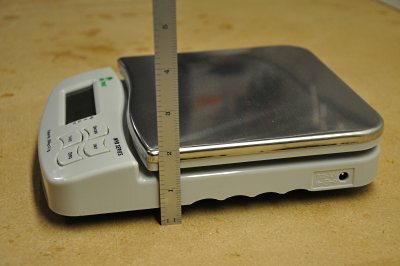 This scale can measure in kilograms, grams, pounds or ounces. You can zero out the reading and you can set a tare. On a humorous note: blow on it lightly and watch it respond! 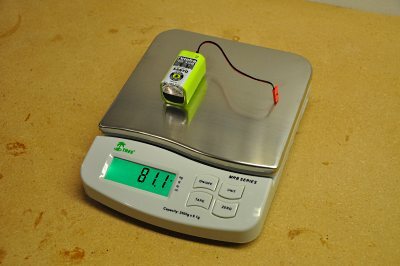 When the scale arrived, I wanted to check its accuracy, so I did something suggested by the manufacturer in one of their videos. 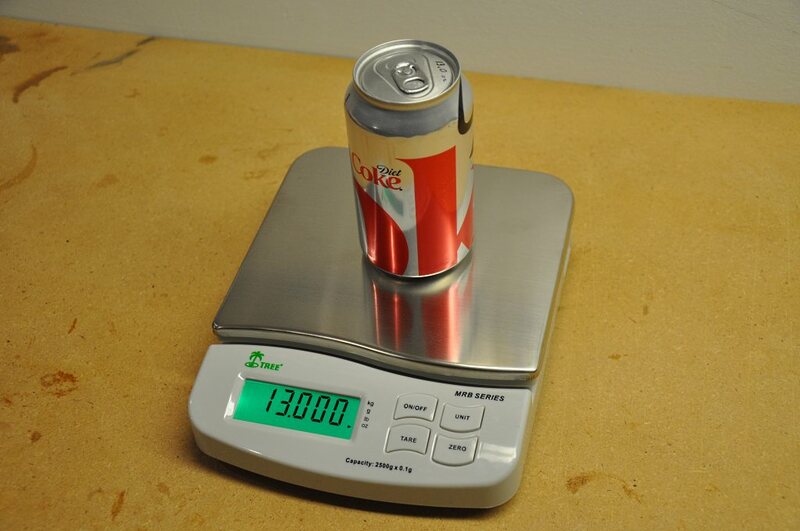 I grabbed a Coke can and took it down to the local post office where they have certified scales. I weighed the can on two different scales and they both reported the can to be exactly 13.00 oz. As you can see in the picture, I was gratified to find that my MRB 2500 reported the same Coke can at 13.000 oz. Nice! 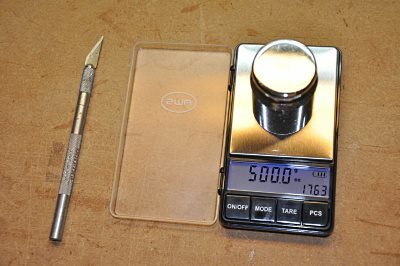 The scale allows for calibration if needed. When looking for scales, one of the biggest issues I had was that most scales capable of weighing in the 0.1 gram range had very small platforms. I also like that the platform is flat and elevated, so that no part of the scale interferes with larger items that might overhang the platform. Just a shot of the side of the scale... 2 inches tall. I was delighted to discover the four finger grips along both sides the first time I tried to pick up the scale. They fit my hands nicely, and made lifting the scale more secure. The scale runs on 6 AA batteries or, as you can see on the side, house current via a provided adapter. A second, smaller scale that I purchased is really great for taking with me to the hobby shops. It is exactly the right size to fit in my shirt pocket. 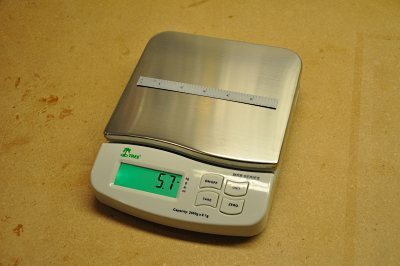 This scale is the AWS ACP-500. It will weigh items between .1 and 500 grams. with a .1 gram precision. 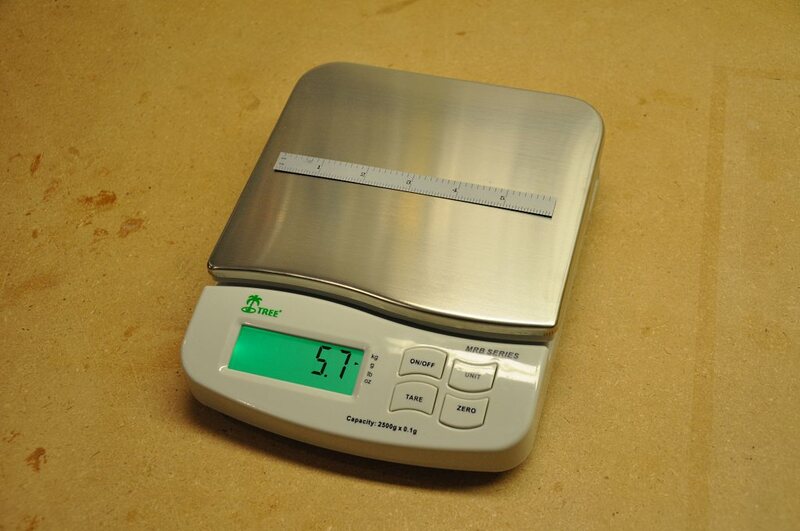 In the picture you can see the 500 g. calibration weight that I purchased to keep the scale calibrated.